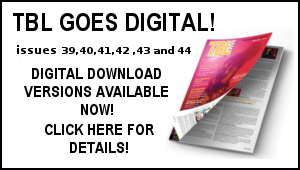 Signed off TBL 24 with Martyn last week and it should be on its way to you very soon. 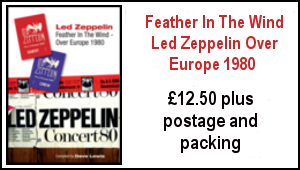 Another striking front cover design and a variety of Zep related topics to set you up for the months ahead. 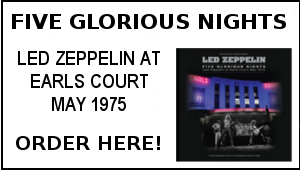 Ordering details can be accessed from the TBL home page, along with ordering details for the Knebworth book. The latter of which will make a very fine Christmas present. The limited edition is selling fast – all books individually numbered and signed by the author. Incidentally if you would like a personal dedication, just put a note on your pay pal ‘’instructions to merchant’’ with details of whom it should be dedicated to. Would have loved to have got out to see Robert’s Rockwell 02 appearance, but various things here dictated otherwise. Judging by the You Tube clips and Gary’s review, it was a captivating performance. Here’s hoping he decides to fit in more appearances of this line up soon. Just started reading an interesting book by Tony Klinger called Twilight of The Gods. Tony was the producer of The Who film The Kids Are Alright which as a minor co star I have a vested interest in. That’s me leaping on the stage at the end of the film in the Wings T. shirt and turquoise bomber jacket, the latter as purchased from Cys men’s outfitters in Bedford. 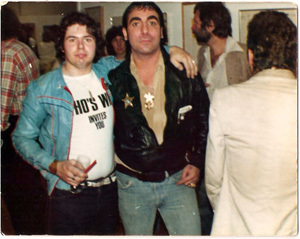 The same bomber jacket the young DL can be seen wearing in the presence of Keith Moon in the accompanying picture taken on August 1st 1978. The book is his story of the behind the scenes wrangling to get the film made. As I came into contact with one or two of the principal players at the time notably the aforementioned Moon and director Jeff Stein, (not to mention albeit briefly Townshend and Daltrey!) it’s turning out to be a fascinating read. Can’t say it was the greatest of weekends just gone. Watched Spurs against Man United in the Fox on Saturday with Adam – even after Defoe’s spectacular first minute opening goal, I texted Max (a United man) with the comments ‘’It’ll end in tears’’. His retort at half time ‘’Don’t you know it!’’ was indication of what was to happen and a 3-1 defeat brought us down to earth. Sam’s departure back to Norwich last Sunday morning brought the expected emotions, though the boy Adam cheered us up in the afternoon by scoring a bit of a cracker in a 5-0 opening game triumph. It’s been a bit strange this week now it’s all very quiet here. These last few days I’ve had no option but to resort to the strains of the melancholy Nick Drake, as I’m currently researching and writing a feature on the forlorn singer songwriter. The likes of River Man, Way To Blue and Day Is Done have therefore created a pale and wistful autumnal hue against the backdrop of grey and windy September weather. It will be good to get some air in my lungs tomorrow (Friday) when my good friend Max and I embark on the annual post birthday bike ride pub crawl around the public houses of mid Bedfordshire. 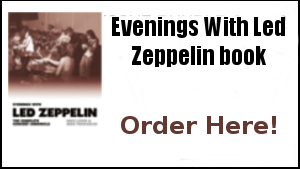 Will there be a bout of Zep karaoke on the way like last year? I think after the Lytton Arms experience It may be time to hang up the microphone. As usual Dave you get the tone of family life just right. Packed Josh off to Uni last week and having driven us mad with his untidiness there’s now that big empty space again! Running Ethans sporting life keeps me busy (Cheadle and Gatley under 16’s going well in division 2 of the Stockport Metro if you’re interested!) but we’re thinking of getting a dog to fill the void, is it a mistake? Hopefully Justin Adams appearance means the Sensation may yet get a revival. Nearly through the Knebworth book, a great read and i keep showing it to friends and then saying they can’t read it they have to buy it to support the author! By the way how’s the job hunting? Finally spare a thought for the once mighty Leeds, at home to Liverpool tonight hope we give them a game.